Sorry for the blogging drought the last few weeks. It's been hectic around here and we got a little "blogged down." Fortunately times like this give us lots of material to blog about. Here's a taste of what's to come. We had a little Play-Doh party for Lila's 3rd birthday. These were the invitation that Johnny and I made. Even Abby got in on the preparations. Here she is helping to sand the "rolling pins"
we wish he could have been here too. We missed him! 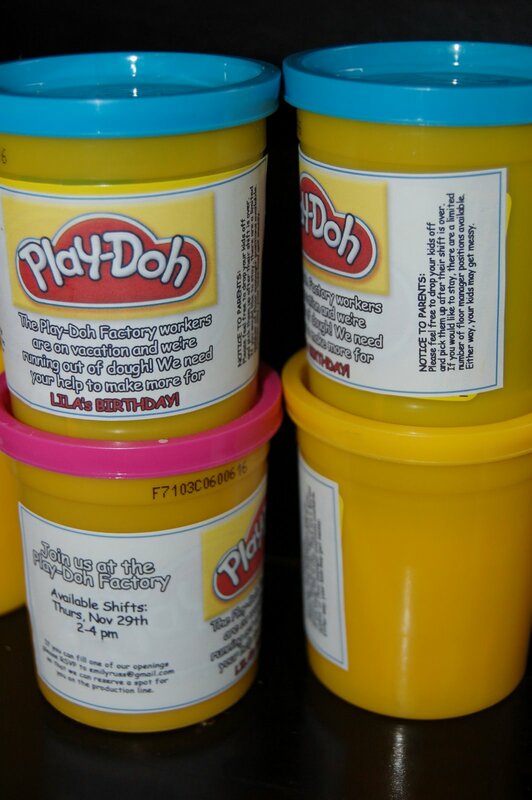 I love the Play Doh birthday idea! So cute and creative. I bet they all had a fun time! Kay loves her play-doh. She had so much fun and from what I saw dropping her off and picking her up there were tons of super cute activities! Thanks for all your hard work, you always have such cute ideas for parties!!! Emily, I was wondering where you had gone. I have gotten used to keeping up on your life. Wow now I know...you've been super busy!! Cute pictures. Post more, I miss your blog. You guys amaze me. That is the cutest idea. How fun!! I had wondered where you had been. I can't wait to see more! I wish we could have been there. Sounds like a fun birthday! I'm also glad to see that we aren't the only ones with new-walker causualties. It is good that everyone is blogging so we can at least try to keep up.